Contrary to popular belief, the history behind zodiac signs isn't one filled with magic or make believe. The story of zodiac signs, and the history of astrology itself, begins with science. Astrology isn't a New Age topic. It's actually older than both psychology and astronomy. Astrology studies the movement and interactions of the planets and stars, using precise and complex mathematical calculations. Ancient astrologers combined their knowledge of the planets and stars with keen observation to create zodiac signs. Ancient astrologers watched how people behaved. They noticed that people born in different times displayed similar characteristics. For example, people born in early May tended to have certain personality traits, traits that differed from people born in late September. 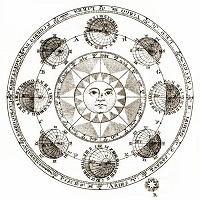 Astrologers used the stars to keep track of the times of the year that people were born. Zodiac signs were born to simplify things. Think of it as a type of shorthand for when someone was born. Zodiac signs don't influence people or their personality. That's a common misconception. Zodiac signs simply tell you when you were born. They also tell you that people born in the same time period generally have certain characteristics, and you may have some of these characteristics. Your zodiac sign doesn't influence you. It's still up to you to decide how you want to behave. Your zodiac sign is just a guide. It's based on observation and may or may not apply to you. You may notice that some parts of your zodiac sign may apply to you, while others may not. It's up to you to look at the information and see what fits. The more introspective and self-observant you are, the easier it will be. People who say astrology is fake or a bunch of mumbo jumbo usually aren't self-observant or introspective. They often need the guidance of a psychologist or therapist to help them figure things out about themselves. I'm not saying there's anything wrong with this! It's just that astrology may be challenging for them if they don't know themselves well. Use your zodiac sign to learn about yourself. Look at its strengths and weaknesses and see if yours match up. Let your zodiac sign be your guide to areas you may need to improve. The same goes with people you meet. While their zodiac sign may give you insight into the reasons behind their actions or who they are, only a small part may apply. Astrology charts are complex with many planets interacting. It's often only through understanding the entire chart that we can gain insight into a person. Just as the history behind zodiac signs is based on observation, take some time to observe yourself and others. Then see what fits.